Angelic Voice and Community Choir is looking for Children singers boys and girls who are able to sing and learn new songs quickly. This position only applies to children that can be accompanied by an adult for every rehearsals. 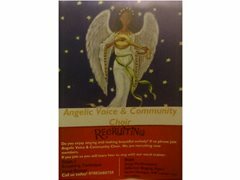 Angelic Voice and Community Choir is a charitable choir. Children should only apply for this role if accompanied by an adult throughout each rehearsals. Children will NOT be allowed to stay if they will be dropped off. An adult must stay with the child or children throughout rehearsal.